Unlike their domesticated cousins, Wild Turkeys worry little about the approach of Thanksgiving. However, this wasn’t always the case. In fact, loss of habitat and unregulated hunting nearly wiped out all of U.S. Wild Turkeys by the mid 1930s. There are two species of wild turkeys, the Wild Turkey found throughout the United States and the Ocellated Turkey, endemic to Mexico’s Yucatan. The Wild Turkey consists of five sub-species, which for the most part are found in specific geographic areas: the eastern U.S., one in Florida, one in Kansas, Oklahoma and Texas (the Rio Grande sub-species), one in the western mountain states (Merriam’s) and the rarest (Gould’s) found only in Mexico and some sky islands in Arizona and New Mexico. 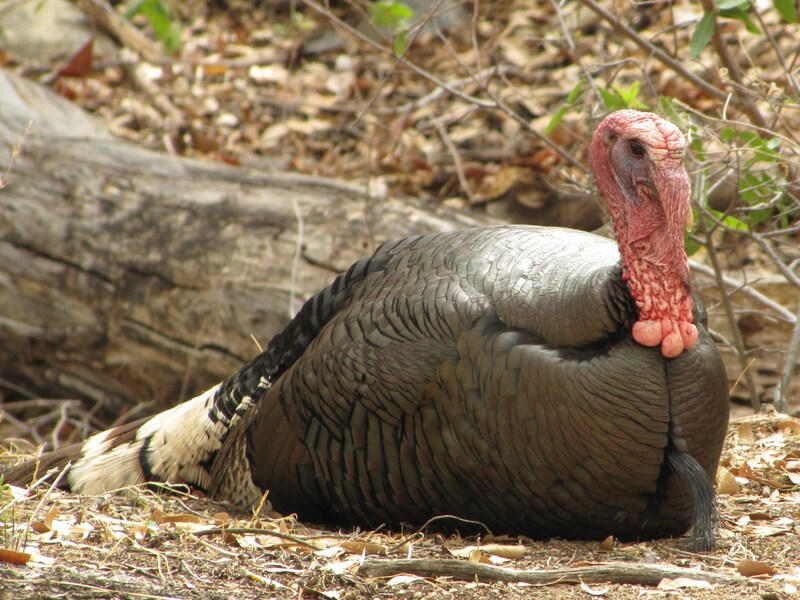 Although the Wild Turkey has successfully recovered from near-extinction, the bulk of today’s populations are found in the Eastern, Rio Grande and Merriam’s sub-species. Here in Arizona, we have two native sub-species of Wild Turkey, the more common Merriam’s and the rare Gould’s. Most of Arizona’s Merriam’s turkeys are found in ponderosa pine forests north of the Gila River. Near SaddleBrooke, you might find turkeys on Mt. Lemmon, Ramsey or Madera Canyon. With a total U.S. Population estimated at less than 1,000 birds, Arizona Game and Fish Department is continuing efforts to expand existing populations by capturing and relocating selected birds. When over-hunting of birds nearly extirpated turkeys in the 1930s, state wildlife agencies across the country tried desperately to restore them to former levels. Initially, this was attempted by releasing pen-raised birds, but survival rates of these near-domesticated turkeys were too low. It took twenty years before success was finally achieved, through the capture of wild birds in one area and their release in a different, non-populated area. In Arizona, miners subsisted on Gould’s turkeys, and by the time Arizona implemented regulated hunting of turkeys in 1929, not a single Gould’s remained in the state. Ironically, the biggest boost to the Wild Turkey’s recovery came in 1973, with the founding of the National Wild Turkey Foundation, established primarily to protect the future of turkey hunting. The NWTF is a nonprofit conservation and hunting organization, and its efforts, together with that of other state and conservation organizations has proven enormously successful. The number of Wild Turkeys that had recovered to about 1 million birds by 1973 is now estimated by the NWTF at more than 7 million. So this Thanksgiving the Wild Turkey also has reasons to be thankful. About 7 million, in fact. Although hunting in Arizona is permitted for both native species, it is strongly restrictive and tightly controlled. During a limited season in April and May, hunters are limited to one ‘bearded gobbler’ and permits are available only through a lottery. The license and tag fees are $229. When you add the cost of a shotgun, ammunition, camouflaged undies and a guide, the frozen bird at Basha’s looks like a bargain. 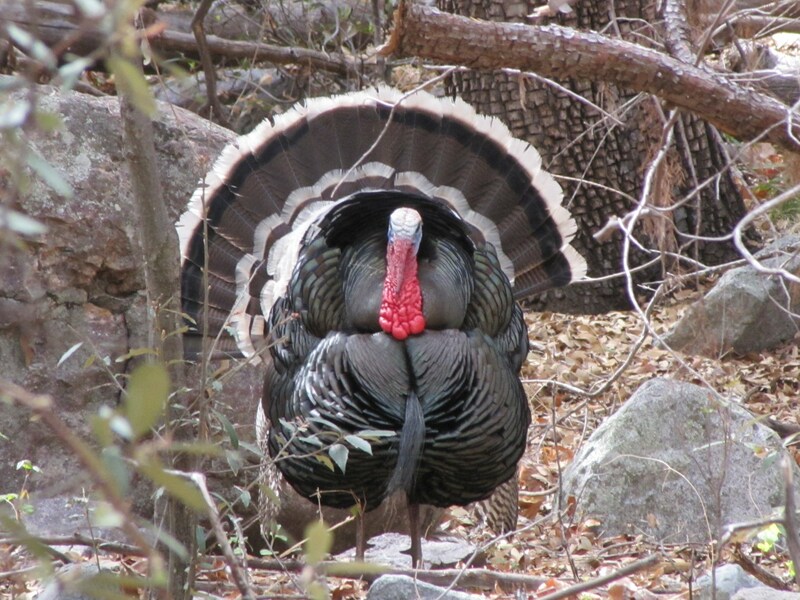 This entry was posted in Birding Arizona and tagged Gould's Turkey, National Wild Turkey Foundation, Wild Turkey. Bookmark the permalink.